Due to aging, hip bones tend to become fragile or continuous worsening of the hip bones due to arthritis may lead to Total Hip replacement surgery. 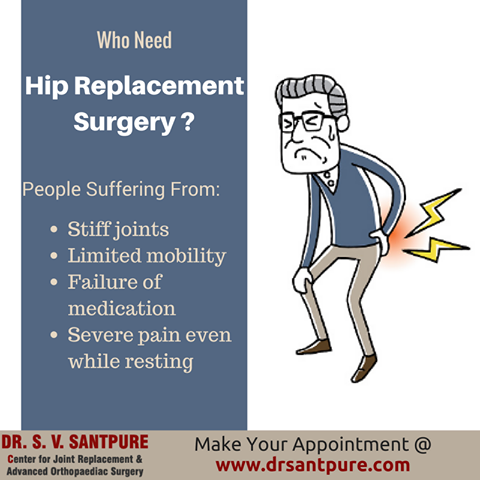 The constant pain while walking, climbing up stairs, sitting and disability to continue routine activities are some reasons, when total hip replacement surgery is considered. The procedure: The damaged part of the hip is surgically removed and an artificial joint or prosthetic is attached to the remaining bone. The prosthesis is either made of metal or hard plastic. The ball and socket prosthetic may be attached using cement. The total hip replacement surgery will help you get rid of the chronic pain. After the surgery the hip pain may decrease significantly or be eliminated completely. The surgery will help restore all the daily activities such as walking, climbing stairs, sitting, getting up with ease. The surgery will help improve the mobility with ease and less stress. After the surgery, the patient leads a more relaxed and active life without being dependent on anyone. Infections: The infections may occur where the prosthetic was attached. The prosthetic is a foreign body and hence becomes the attracted ground for bacteria to grow. The blood supply had been altered during the surgery. Hence the blood supply is not sufficient to fight these infections. Eventually, the bacteria may out power the anti-bodies. A revision surgery to remove the prosthetic may be performed in such conditions. Blood clots: Clotting of the blood is the most common and complicated after fall of the hip replacement surgery. The blood clots can prove fatal to the life of the patient. The orthopedic may suggest some blood thinning medicine. Fracture: Some of the hip joints may break during the replacement surgery leading to fracture. Mostly, the fractures are minor and it heals on its own. Major fractures need corrective surgery such as bone grafting or joining by wire or pins. Inequality of leg length: The leg may be lengthened or shortened during the surgery. People have found inequality of their legs post-surgery. The most common occurrence is the lengthening of the leg. The surgeon takes care to avoid such situations. Sometimes, the inequality is caused by the weakness in the muscle. In cases of short length, correction surgery is performed.